Hello, I managed to squeeze in a card for the Waltzingmouse Sketch Challenge this week. I do love making Valentine's cards, so you'll be seeing quite a few more in the run up to Valentine's Day. A nice simple sketch this week. Check it out. I used the lovely heart stamp from Seasons of Love - Tags from Waltzingmouse Stamps as a base for my roses. I used some sweet Pink Paper Tea Roses and Fuchsia Medium Tea Roses from Craft Fairy. These are just so pretty! The green chiffon ribbon is also from Craft Fairy. 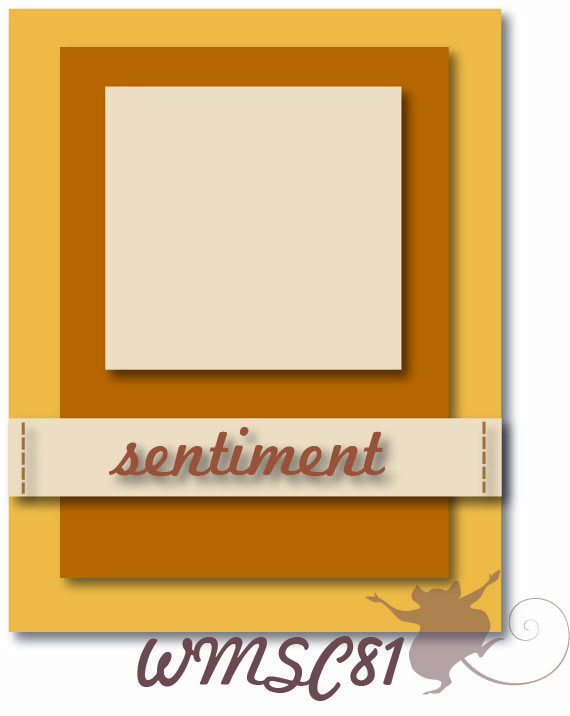 For the sentiment I used Say it Loud from Waltzingmouse Stamps, cut out and propped up on several foam pads. 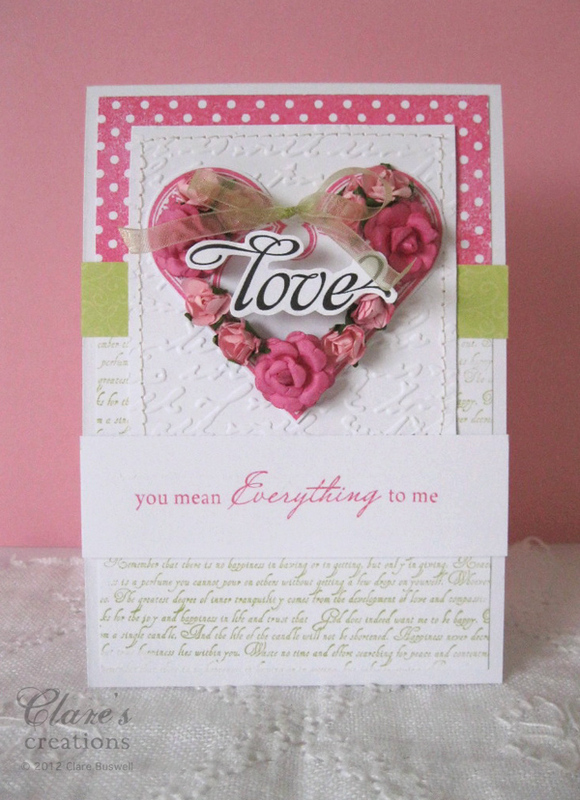 I used a Script embossing folder on some plain white card for the square behind the heart. The bottom half of the card I stamped some text from Text-It, the sentiment is from Roses in Bloom, both from Waltzingmouse Stamps. OTHER: SCRIPT EMBOSSING FOLDER, SEWING MACHINE. Clare, it's absolutely beautiful. It all works so well and the Craft Fairy roses are stunning. Thank you. Oh, Clare, I LOVE this card! It hits all the right notes....hearts and flowers and beautiful script! Love, love, LOVE! Oh my, Clare, this card is really really lovely. Everything about it! But the rosey heart, especially, makes me smile. One for the inspiration folder! Wow, this is such a stunning card. 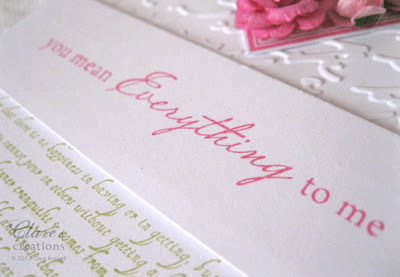 I love the pink with the splash of green and I love your use of white. And the heart is adorable! I could look at this card all day! Clare - this is lovely. 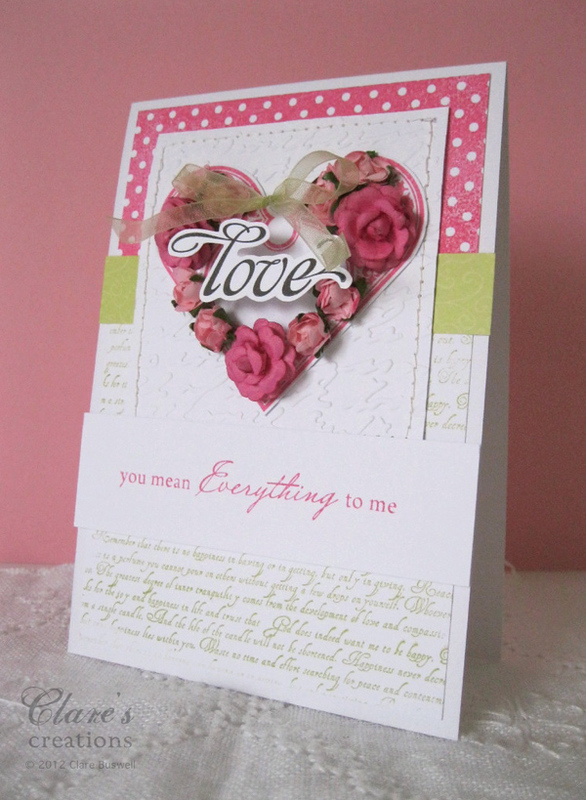 I love the roses on the heart and the pretty background paper you've made is fab! Great work! So sweet! 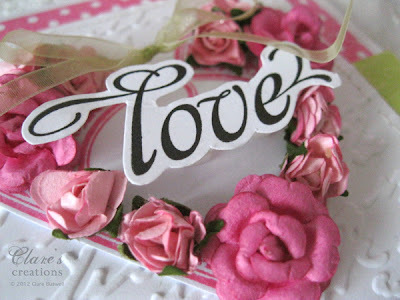 Love the rose-shaped heart! Gorgeous card Clare. Lovely colors. Thanks for the inspiration! My oh my I can see why you're on the team. This is brathtaking! 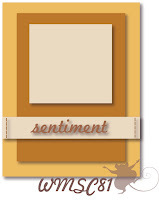 I love the way you decorated the heart and layered the sentiment on top of it. Gorgeous!